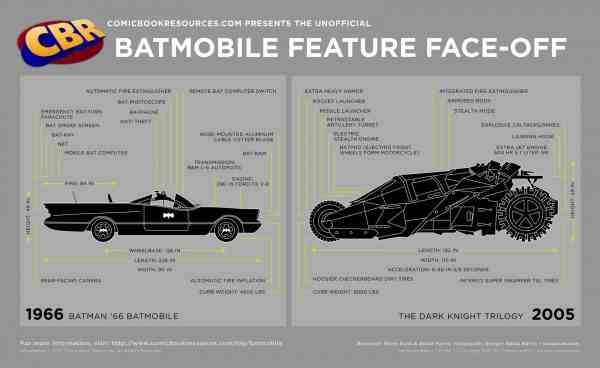 After 75 years of omnipresence, one can make a very strong case that the Batmobile is the most iconic automobile in all of pop culture history. Since Batman's debut back in 1939's "Detective Comics" #27, the caped crusader has always relied on a car -- usually a stylish, feature-loaded one -- to get him from his cave to crime scenes. As a crucial part of the Bat-mythos, the Batmobile -- dubbed such in 1941's "Detective Comics" #48 -- has appeared in everything from comics and cartoons to films and video games. Wherever you see Batman, odds are the Batmobile is parked just a few blocks away. With the Batmobile poised to make it's eighth big-screen appearance in 2016's "Batman v Superman: Dawn of Justice," former CBR editor Steve Sunu set about researching the most intimidating car on DC Comics' streets. Did you know that the original Batmobile was red? Or that the "Batman '66" version had an "emergency bat-turn parachute"? Or that you could buy almost three "Dark Knight" tumblers for the cost one one Lamborghini Veneno Roadster? Graphic artist and COMICS SHOULD BE GOOD contributor Sonia Harris brought all these facts together in the three infographics below, designed to get you up to speed on the fiction's most notable car. 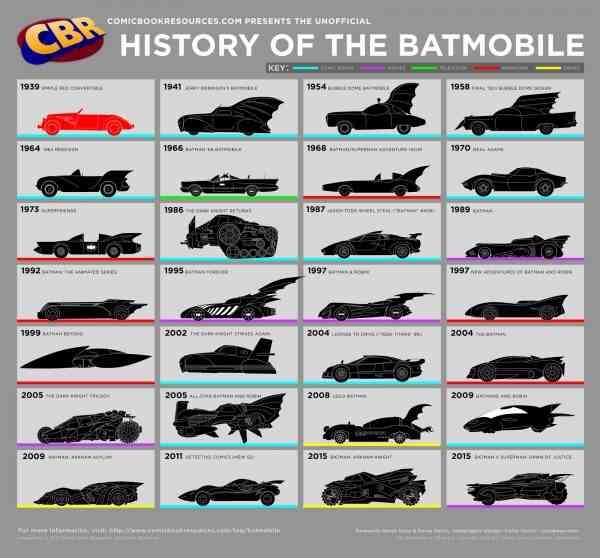 Peruse CBR's three Batmobile infographics and broaden your knowledge of comics' most famous car -- and feel free to share and discusses these infographics on social media with #CBRBatmobile!